.Negotiations don't have to be hard nor soft, but rather both hard and soft. And so begins a journey into improved negotiations that starts with Getting to Yes by Roger Fisher and William Ury. 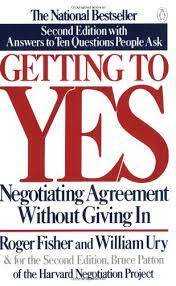 This is one of the cornerstone books in the areas of negotiation, mediation, and conflict management. The authors offer great insight into the groundbreaking work of the Harvard Negotiation Project. The group developed an alternative to positional bargaining called principled negotiation (or negotiation on the merits). This is a method of negotiation explicitly designed to produce wise outcomes efficiently and amicably. The goal of this method is to decide issues on their merits and to look for mutual gains whenever possible. The authors offer wonderful strategies and techniques for you to look for ways to make all of your negotiations a principled negotiation. Besides explaining the four basic points along with examples, they also tackle ideas like imbalance of power, dirty tricks, and dealing with someone who won’t negotiate. ​We all have opportunities to negotiate at some time, so you need to have Getting To Yes on your bookshelf. You can buy it here.